Demo boats available! Try before you buy! The boat launch at the River's Edge is complete and SUPER CONVENIENT now for our customers. No more waiting for pickups! Be sure to print out the waiver form and our checklist of what to bring to make your river trip FUN and SAFE (we supply the life vests and paddles)! You can also view our Services and Rental Rates. NO LARGE COOLERS please! "We at The River's Edge can create a custom trip for you. Interested in camping overnight along the river? Want the best swimming spots, fishing holes, or local places to eat after your trip? Just ask!" Evelyn and Neill Owners, The River's Edge. Get your snacks or drinks from us before setting off! Avonmore to River's Edge - Call for Details! Plan a stop at Roaring Run Get your snacks or drinks from us before setting off! Explore some of the best fishing in Pennsylvania, and stock up at our Bait and Tackle shop! We are excited about our two new primitive campsites, truly right on the River's Edge! Check out our gear shop! 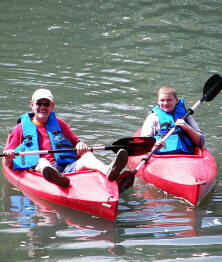 We carry a variety of leading brands that will get you out on any body of water!